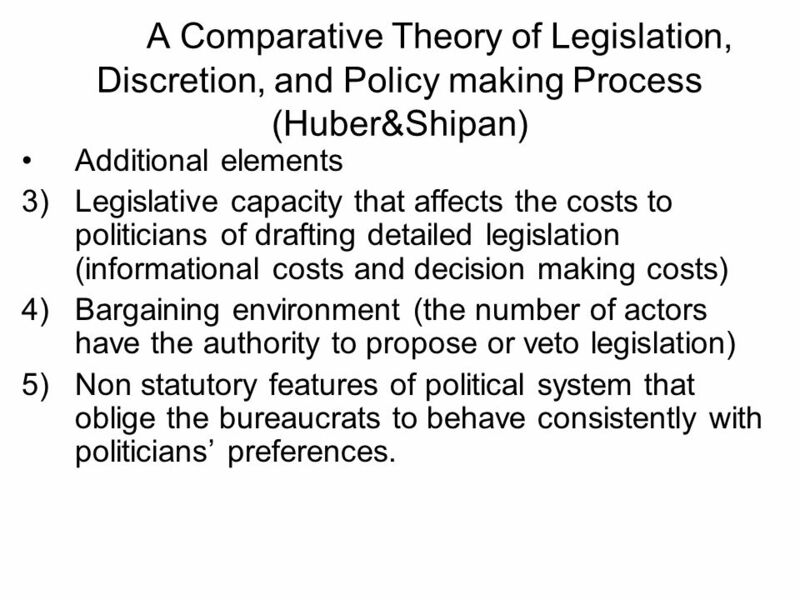 A Comparative Theory of Legislation, Discretion, and Policy making Process (Huber&Shipan) Two crucial elements in the politicians- bureaucrats interaction. 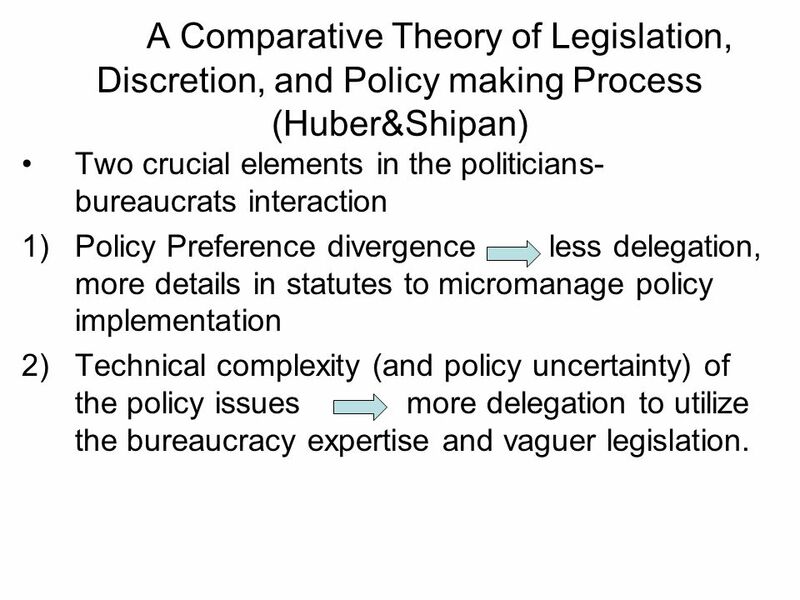 1 A Comparative Theory of Legislation, Discretion, and Policy making Process (Huber&Shipan) Two crucial elements in the politicians- bureaucrats interaction 1)Policy Preference divergence less delegation, more details in statutes to micromanage policy implementation 2)Technical complexity (and policy uncertainty) of the policy issues more delegation to utilize the bureaucracy expertise and vaguer legislation. 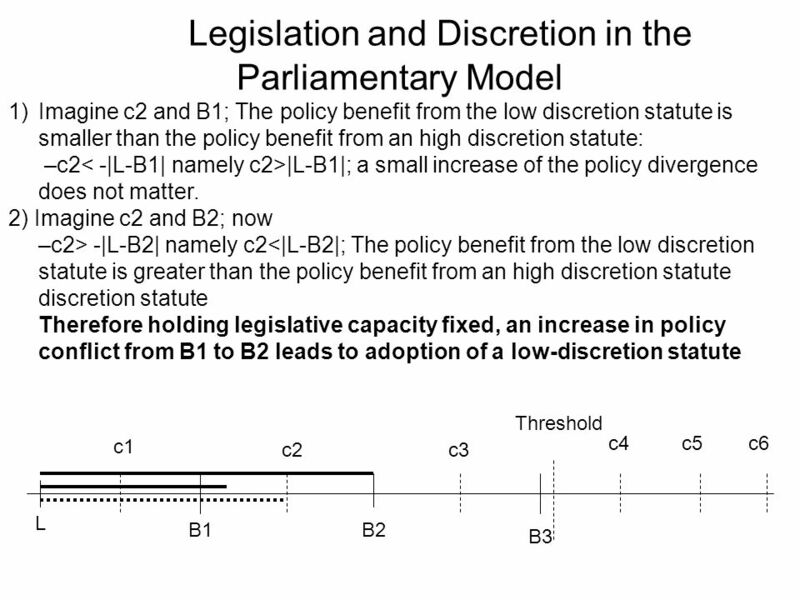 2 A Comparative Theory of Legislation, Discretion, and Policy making Process (Huber&Shipan) Additional elements 3)Legislative capacity that affects the costs to politicians of drafting detailed legislation (informational costs and decision making costs) 4)Bargaining environment (the number of actors have the authority to propose or veto legislation) 5)Non statutory features of political system that oblige the bureaucrats to behave consistently with politicians’ preferences. 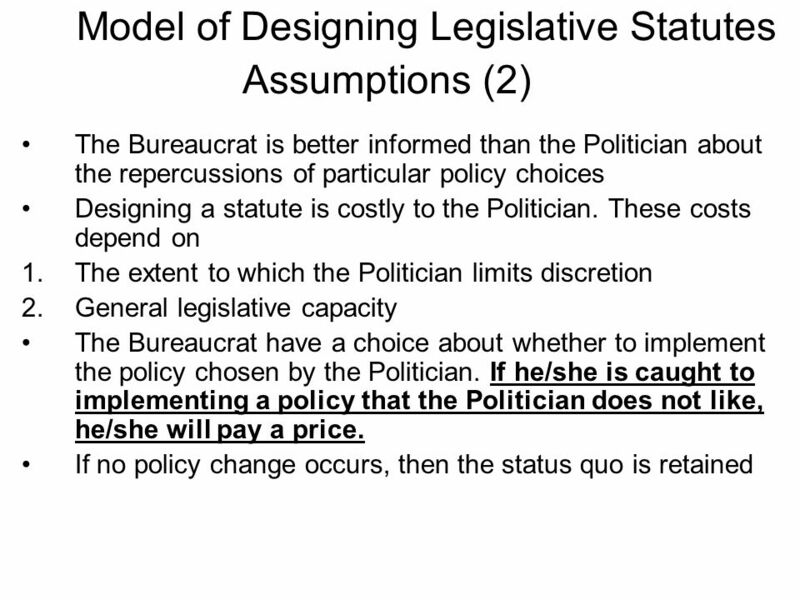 3 Model of Designing Legislative Statutes Assumptions (1) Politician= legislators who determine the level of policy discretion in a statute Bureacrat= who implements the policy once the statute is adopted. 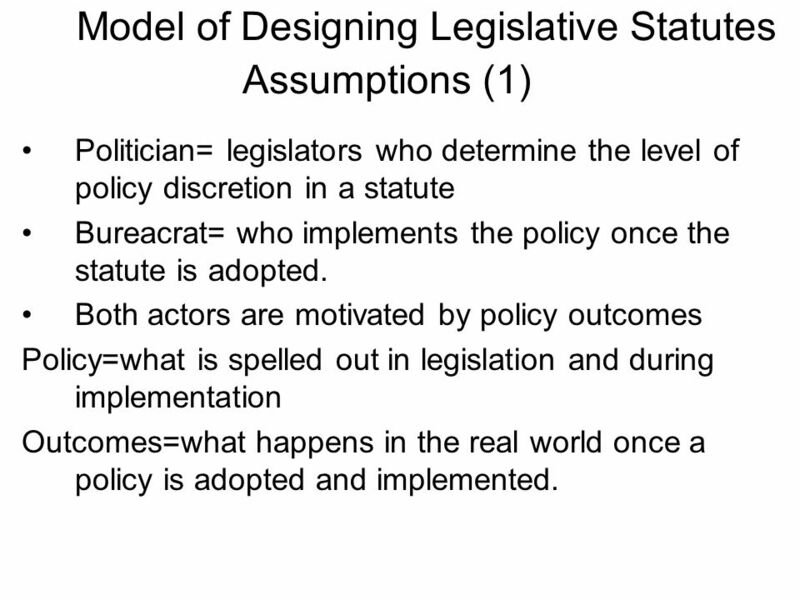 Both actors are motivated by policy outcomes Policy=what is spelled out in legislation and during implementation Outcomes=what happens in the real world once a policy is adopted and implemented. 11 Stage 2. 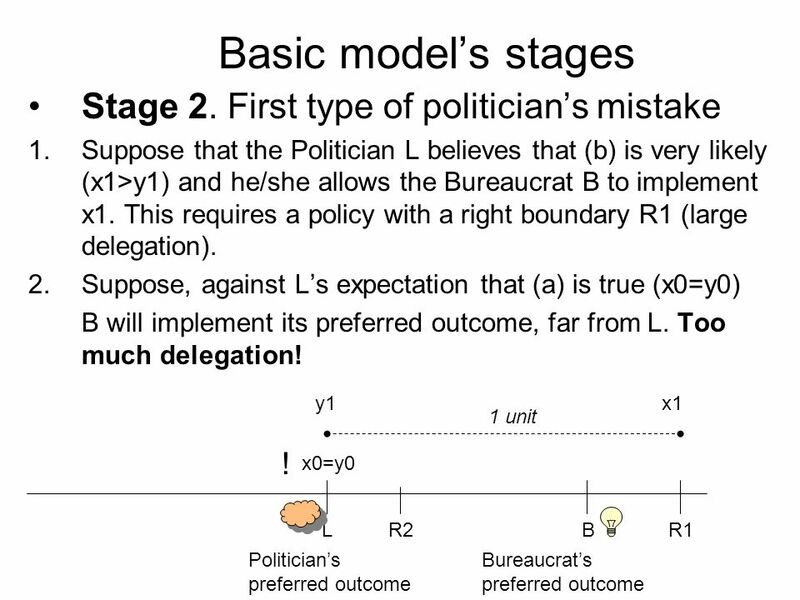 First type of politician’s mistake 1.Suppose that the Politician L believes that (b) is very likely (x1>y1) and he/she allows the Bureaucrat B to implement x1. 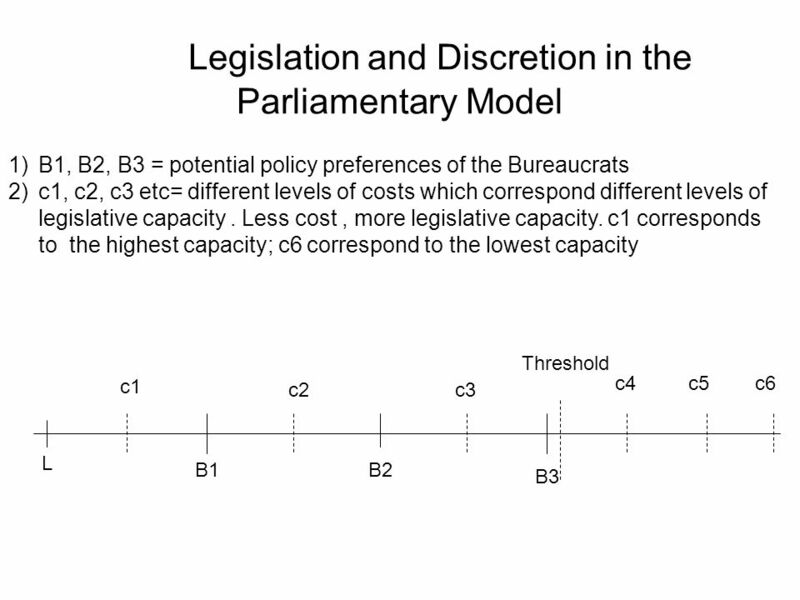 This requires a policy with a right boundary R1 (large delegation). 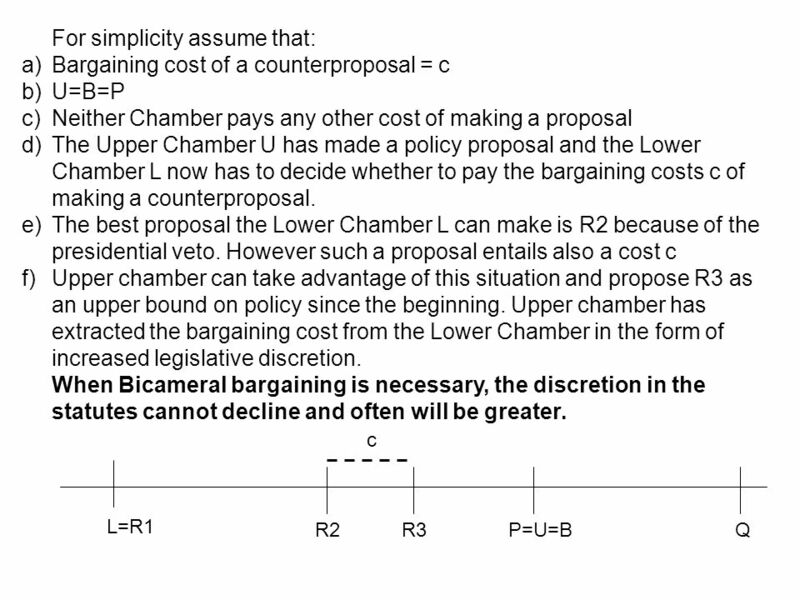 2.Suppose, against L’s expectation that (a) is true (x0=y0) B will implement its preferred outcome, far from L. Too much delegation! 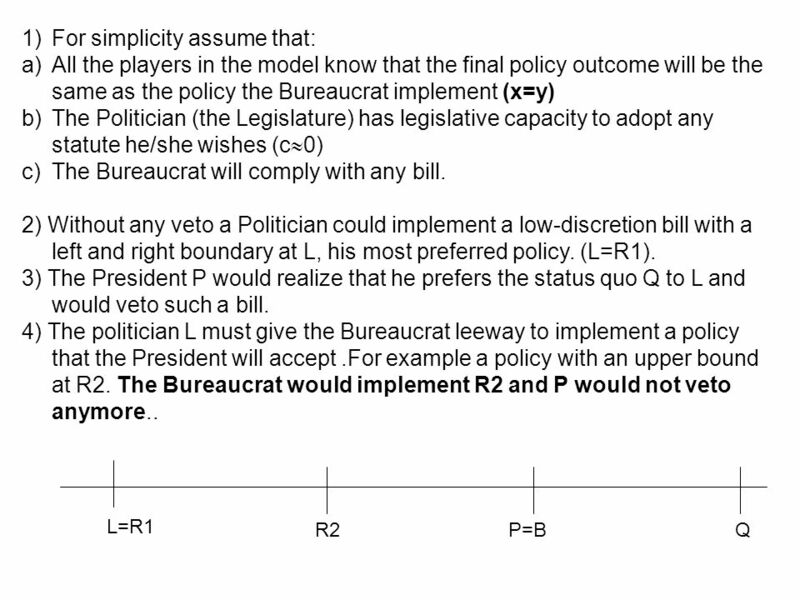 Basic model’s stages LR2R1B x0=y0 y1x1 Politician’s preferred outcome Bureaucrat’s preferred outcome 1 unit ! 12 Stage 2. 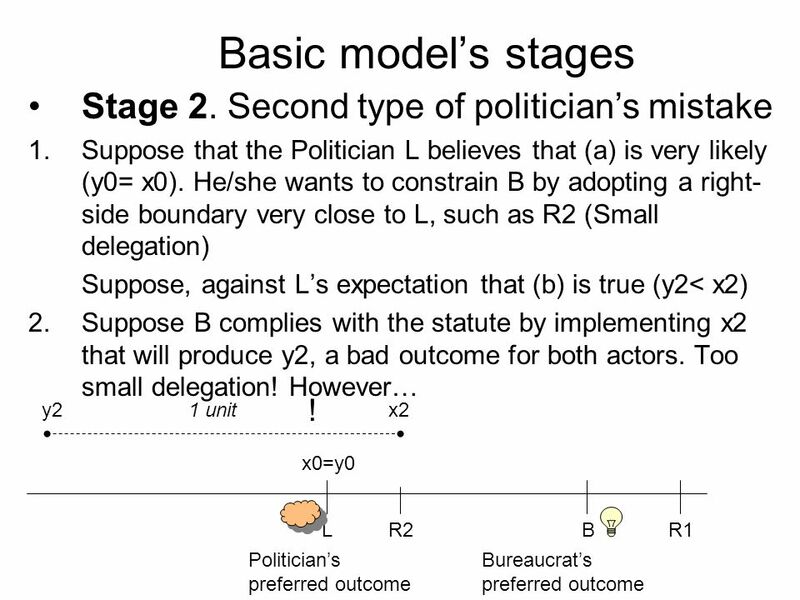 Second type of politician’s mistake 1.Suppose that the Politician L believes that (a) is very likely (y0= x0). 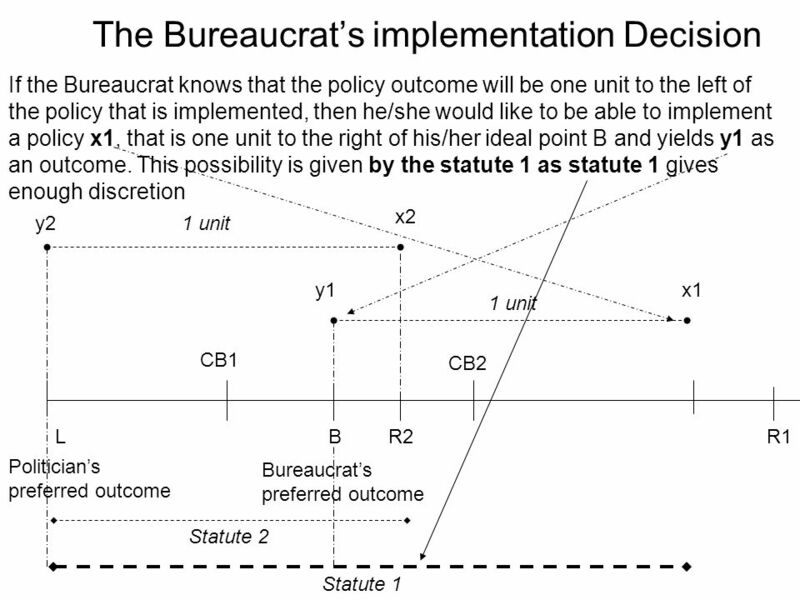 He/she wants to constrain B by adopting a right- side boundary very close to L, such as R2 (Small delegation) Suppose, against L’s expectation that (b) is true (y2< x2) 2.Suppose B complies with the statute by implementing x2 that will produce y2, a bad outcome for both actors. Too small delegation! 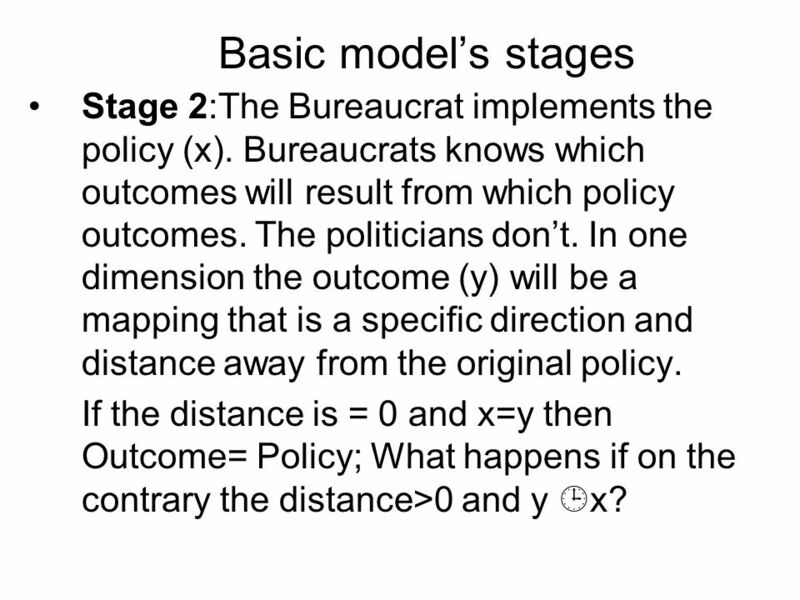 However… Basic model’s stages LR2R1B x0=y0 y2x2 Politician’s preferred outcome Bureaucrat’s preferred outcome 1 unit ! 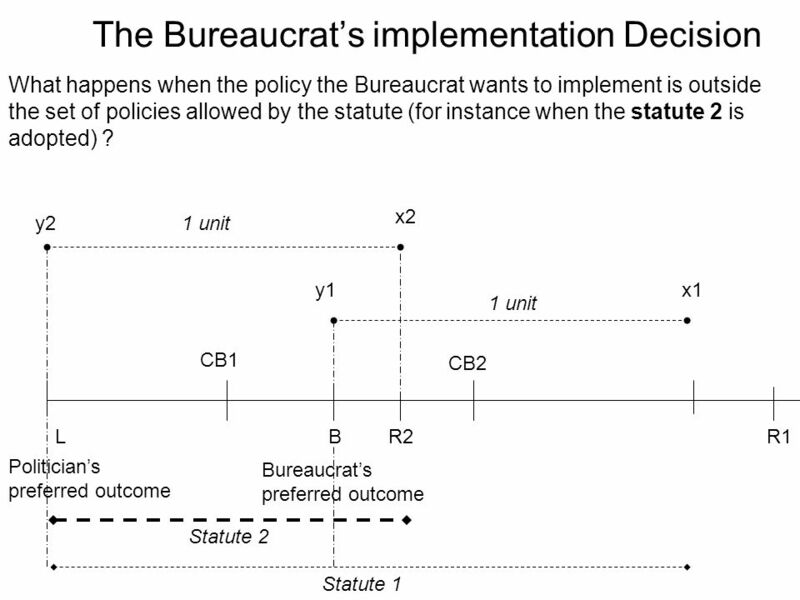 19 The Bureaucrat’s implementation Decision LR2B Politician’s preferred outcome Bureaucrat’s preferred outcome 1 unity2 x2 Statute 2 The compliance boundary (CB) is the point at which the combined benefits and costs of non compliance are equal to the benefits of compliance. 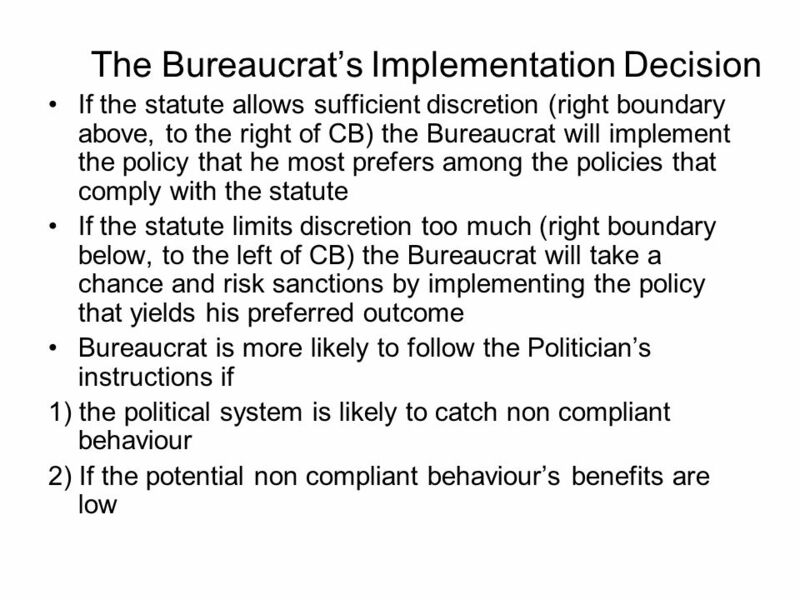 B will be indifferent between implementing a law that is a the compliance boundary and implementing a policy that yields the Bureaucrat’s preferred policy but that also risks sanction when the right boundary of the law, R, will coincide with CB. 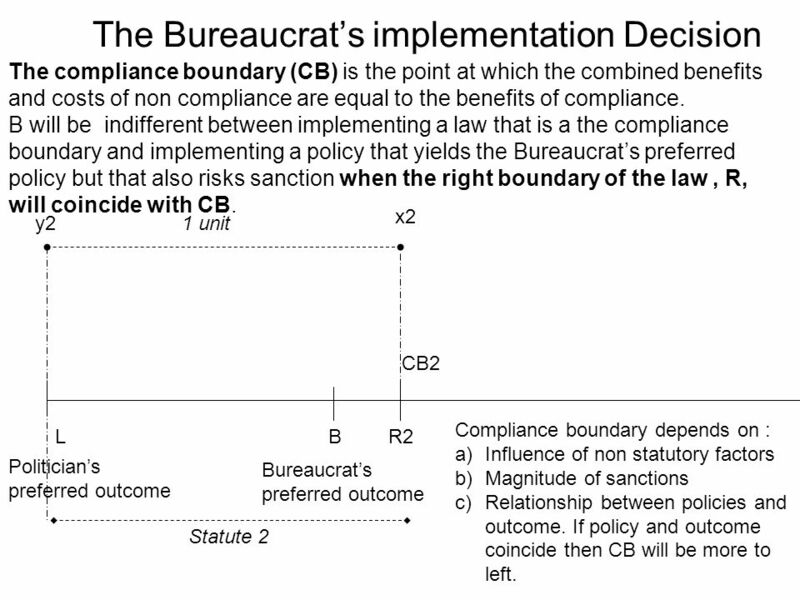 CB2 Compliance boundary depends on : a)Influence of non statutory factors b)Magnitude of sanctions c)Relationship between policies and outcome. 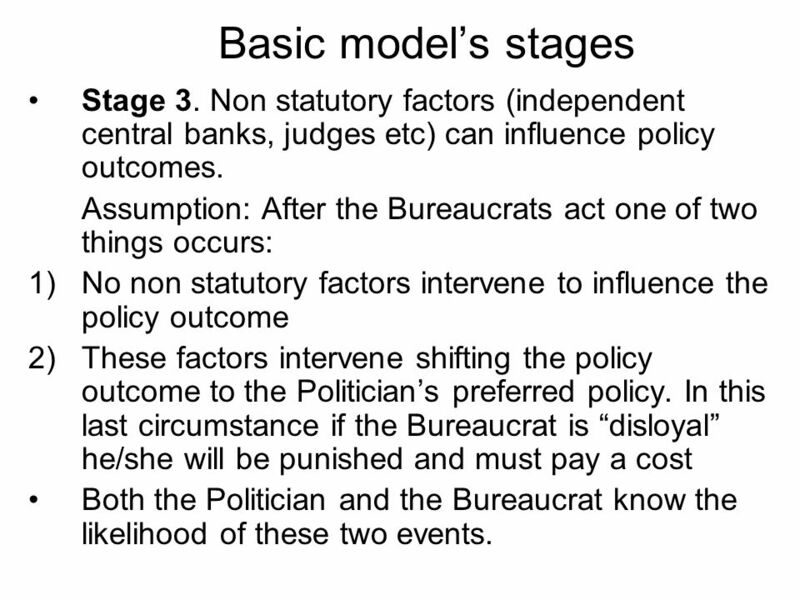 If policy and outcome coincide then CB will be more to left. 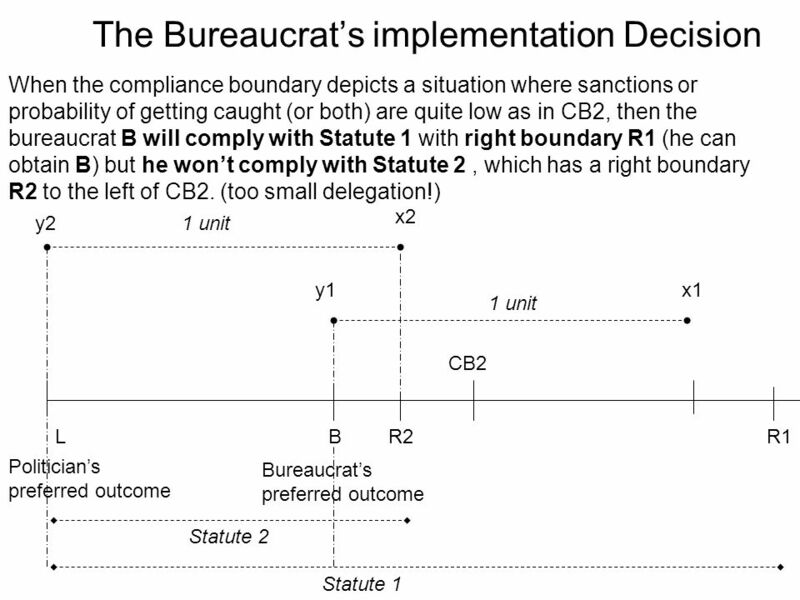 20 The Bureaucrat’s implementation Decision LR2R1B Politician’s preferred outcome Bureaucrat’s preferred outcome 1 unit CB1 y2 x2 Statute 2 Statute 1 If sanctions or the probability of getting caught are large, the compliance boundary CB can be far to the left of B, for instance in CB1. 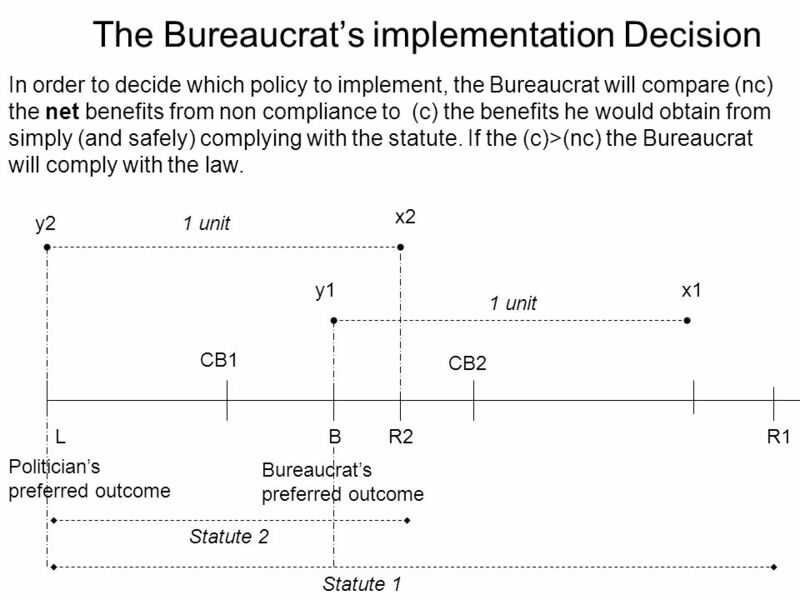 In these circumstances both statutes 1 and 2 are right boundaries (R1 and R2) to the right (above) of CB1. 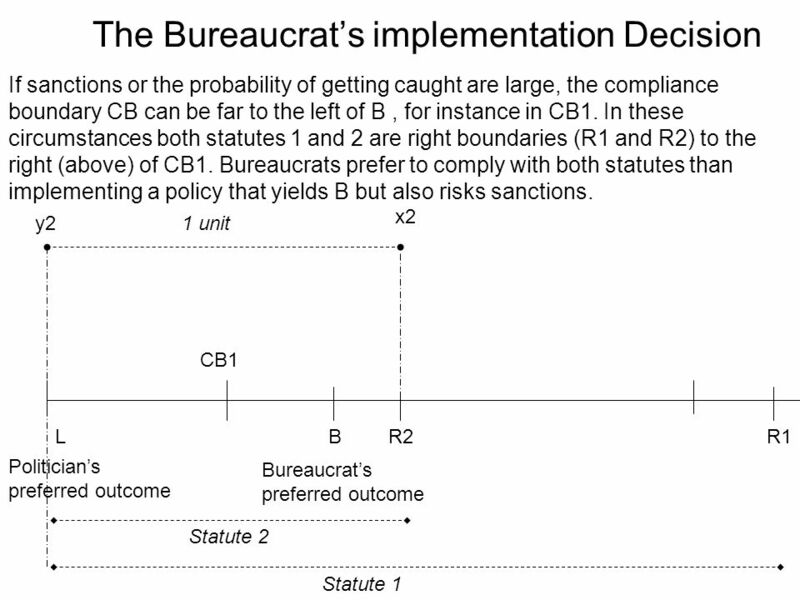 Bureaucrats prefer to comply with both statutes than implementing a policy that yields B but also risks sanctions. 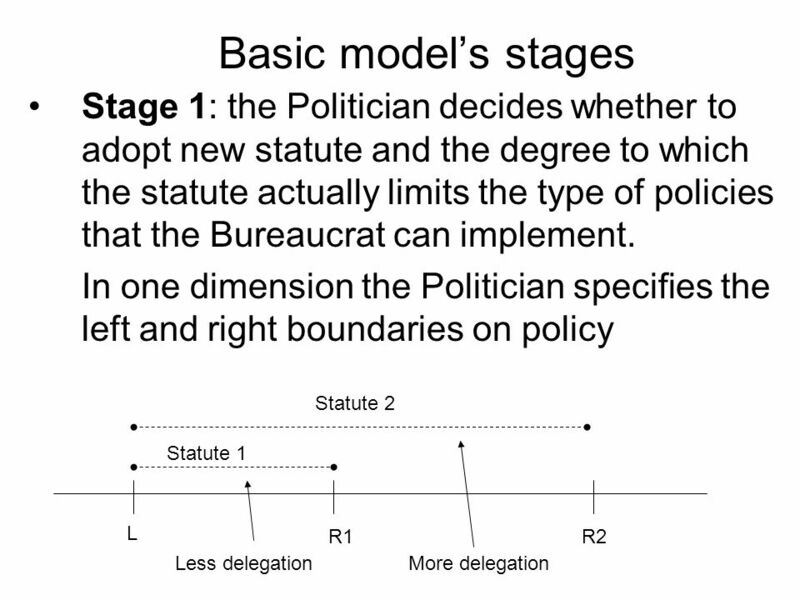 23 The Politician’s optimal statute in certain circumstances For the politician will never be optimal to adopt a statute that the Bureaucrat is certain to ignore (when the right boundary R is to the right the CB). 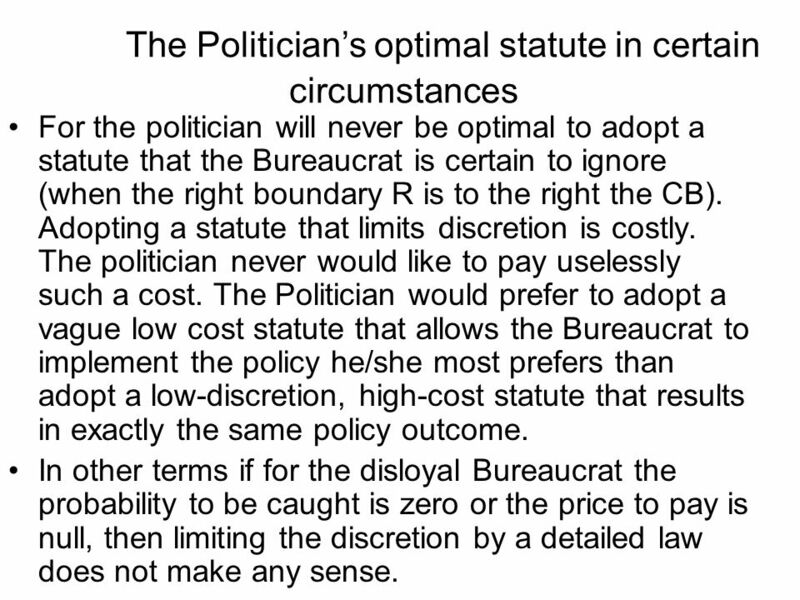 Adopting a statute that limits discretion is costly. The politician never would like to pay uselessly such a cost. 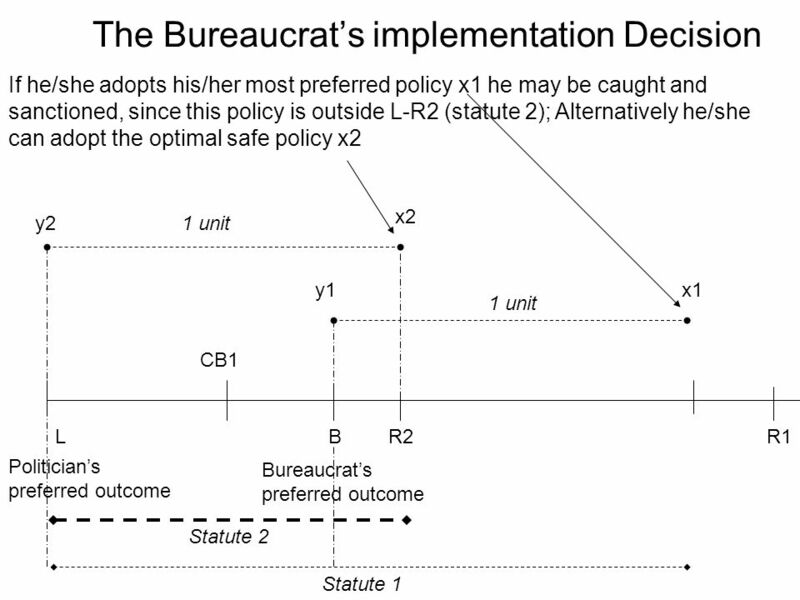 The Politician would prefer to adopt a vague low cost statute that allows the Bureaucrat to implement the policy he/she most prefers than adopt a low-discretion, high-cost statute that results in exactly the same policy outcome. 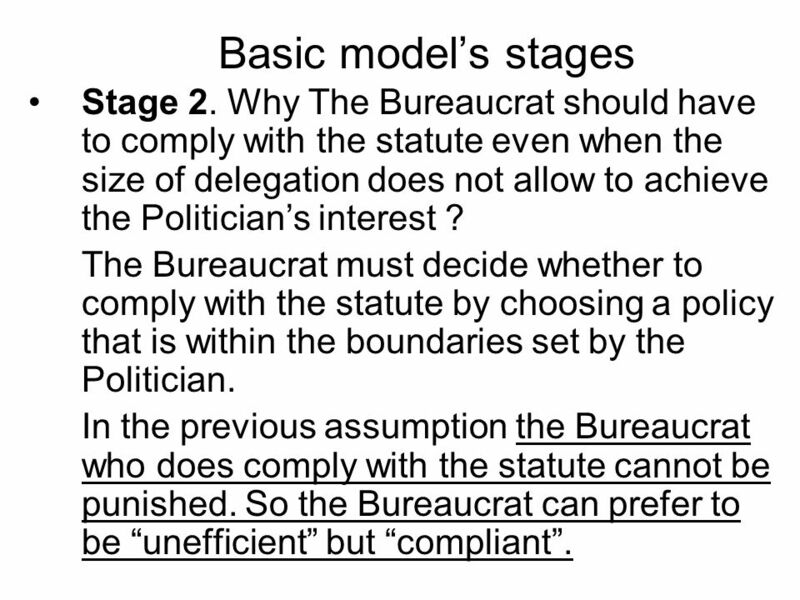 In other terms if for the disloyal Bureaucrat the probability to be caught is zero or the price to pay is null, then limiting the discretion by a detailed law does not make any sense. 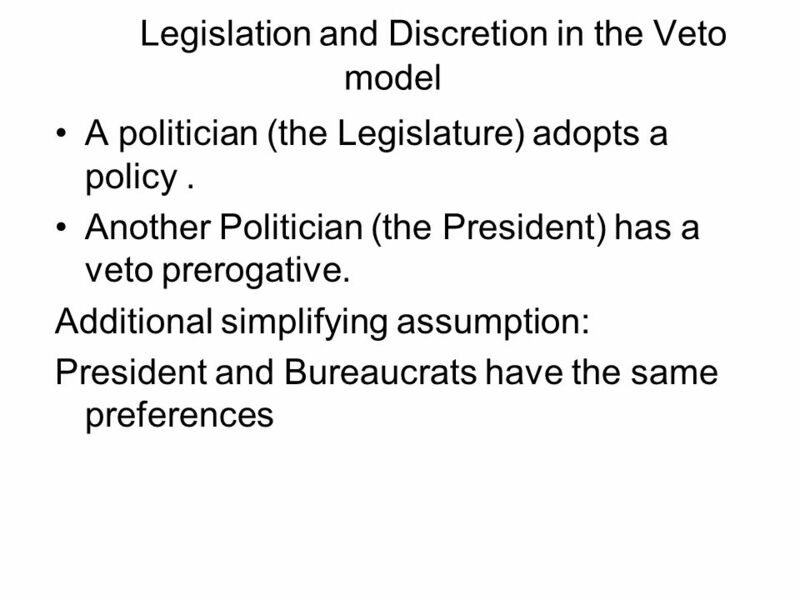 31 Legislation and Discretion in the Veto model In general the same results of the Parliamentary model. 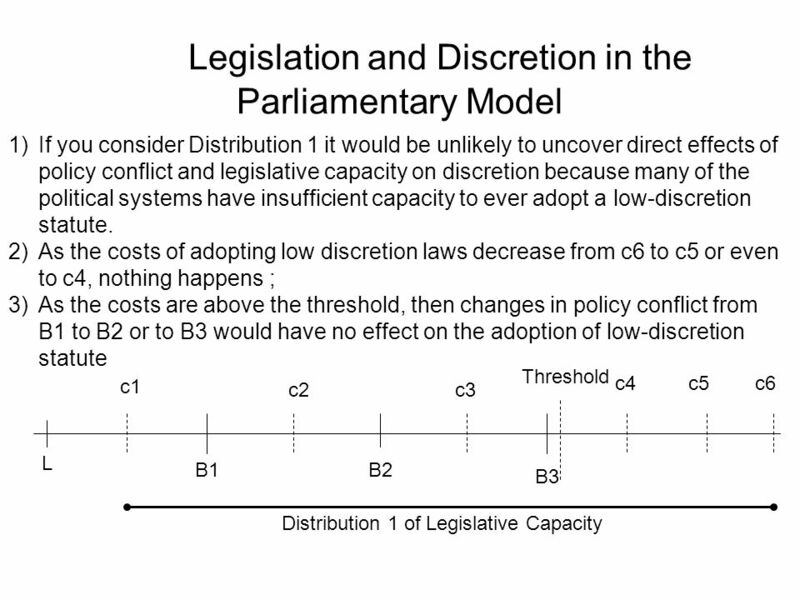 Relative value of low discretion statutes increases 1) As policy conflict between Politician and Bureaucrat increases 2) As Legislative capacity increases 3) As non-statutory factors become less reliable. 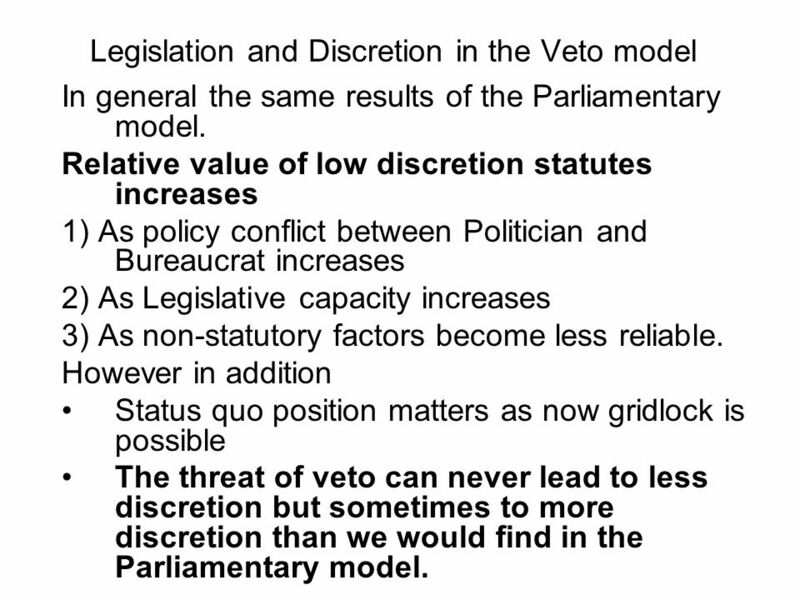 However in addition Status quo position matters as now gridlock is possible The threat of veto can never lead to less discretion but sometimes to more discretion than we would find in the Parliamentary model. 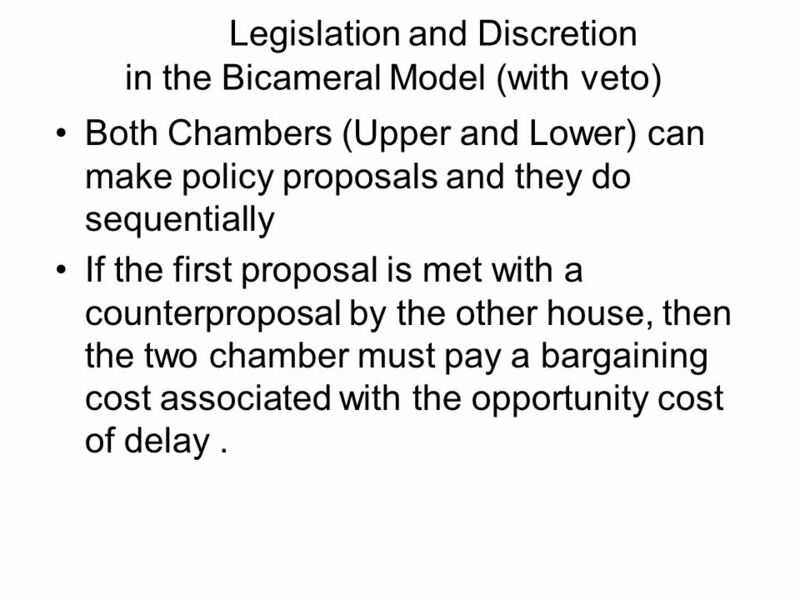 33 Legislation and Discretion in the Bicameral Model (with veto) Both Chambers (Upper and Lower) can make policy proposals and they do sequentially If the first proposal is met with a counterproposal by the other house, then the two chamber must pay a bargaining cost associated with the opportunity cost of delay. 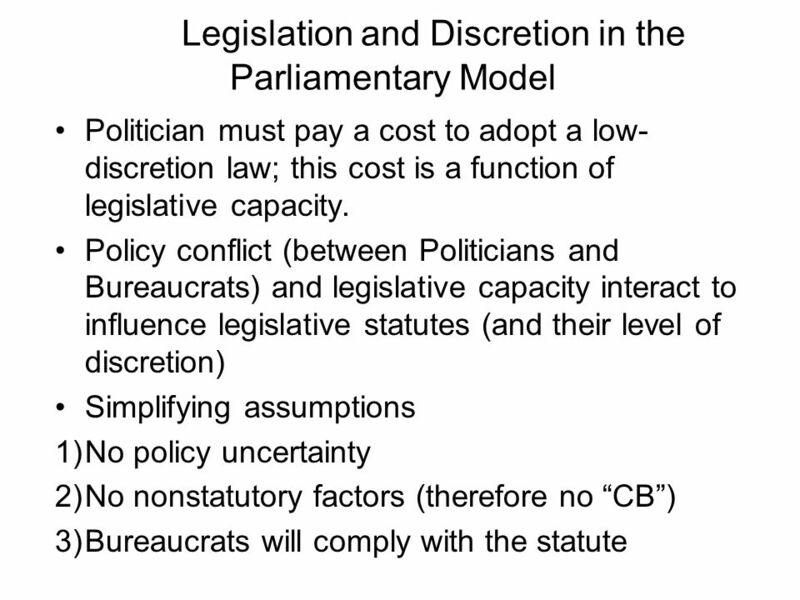 Download ppt "A Comparative Theory of Legislation, Discretion, and Policy making Process (Huber&Shipan) Two crucial elements in the politicians- bureaucrats interaction." 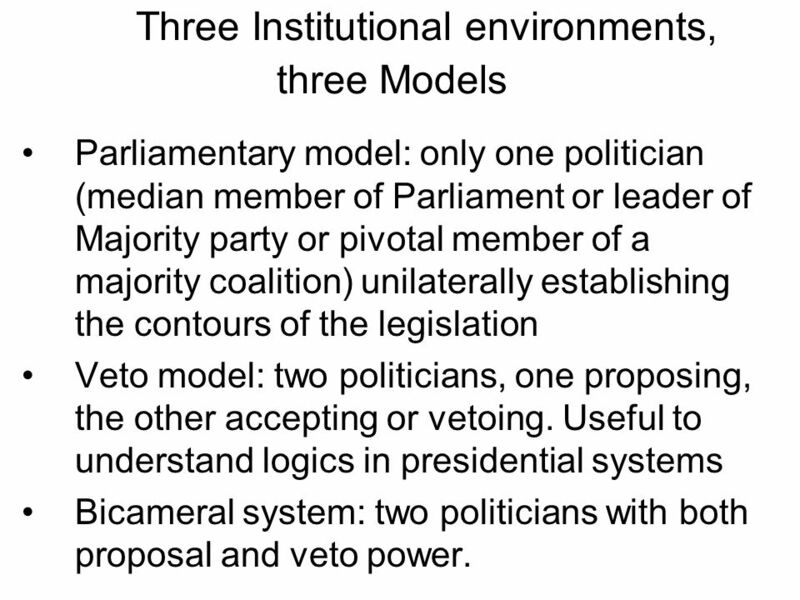 Tools for the Political Analysis of Policy Reform Initiatives Merilee S. Grindle Edward S. Mason Professor of International Development John F. Kennedy. 3. 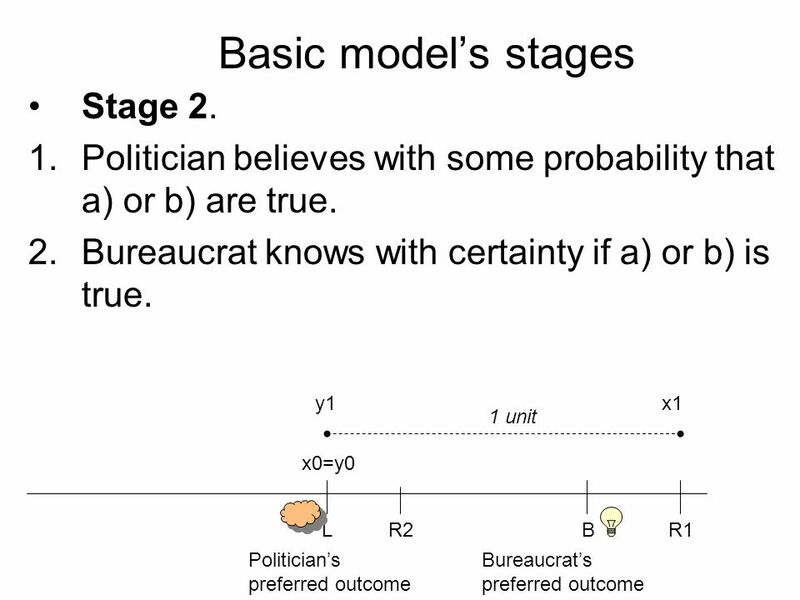 Basic Topics in Game Theory. 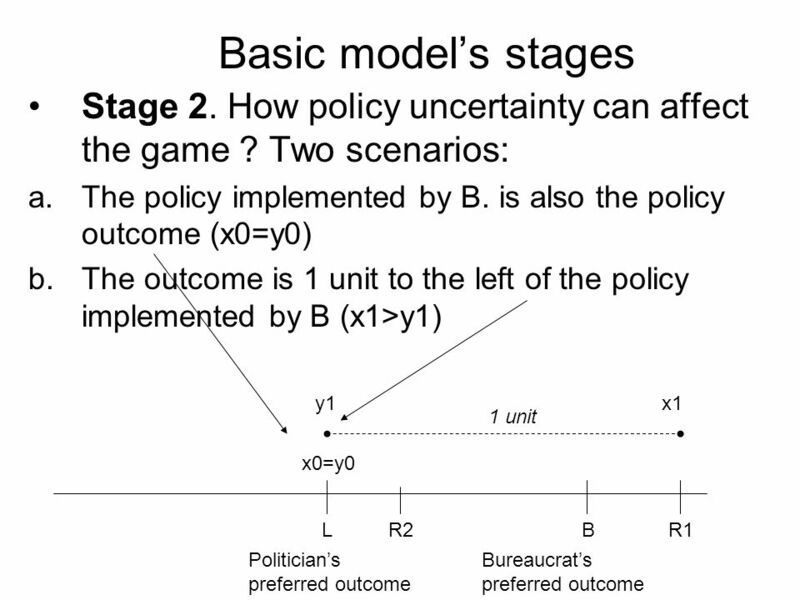 Strategic Behavior in Business and Econ Outline 3.1 What is a Game ? The elements of a Game The Rules of the. 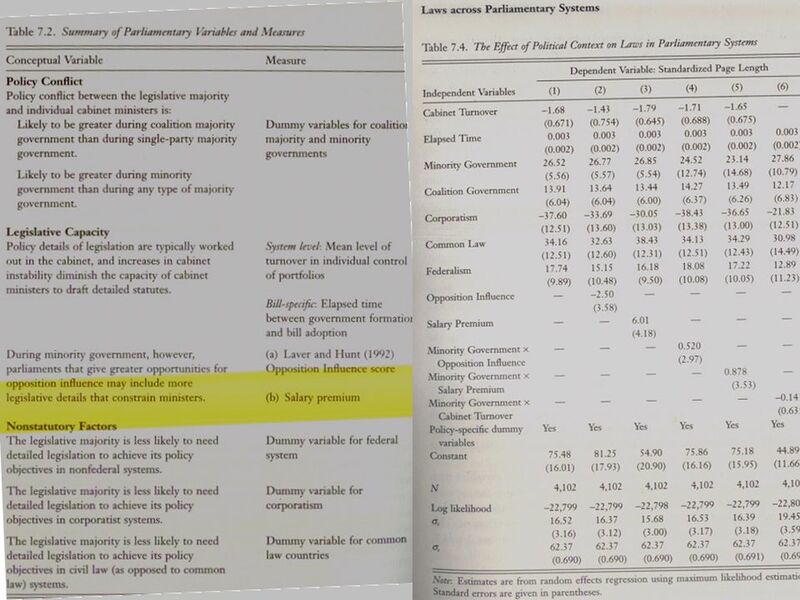 Is There a Discrete Analog of the Median Voter Theorem? James Bradley Calvin College Public Choice 2003. Statistics.  Statistically significant– When the P-value falls below the alpha level, we say that the tests is “statistically significant” at the alpha. 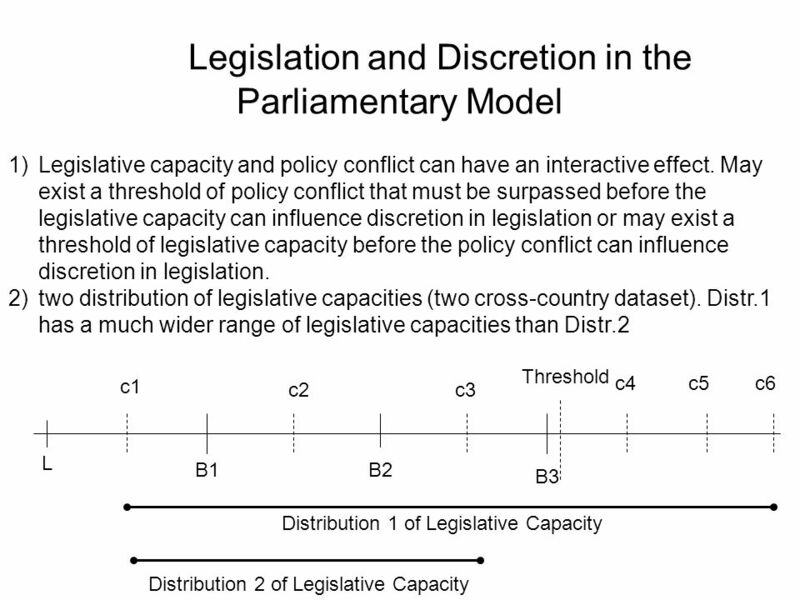 Regulatory Regimes, Agency Actions, and the Conditional Nature of Congressional Influence Charles Shipan, 2004 Stefano Alessandro Rognoni EPS. 4 Why Should we Believe Politicians? Lupia and McCubbins – The Democratic Dilemma GV917. Testing Hypotheses About Proportions Chapter 20. 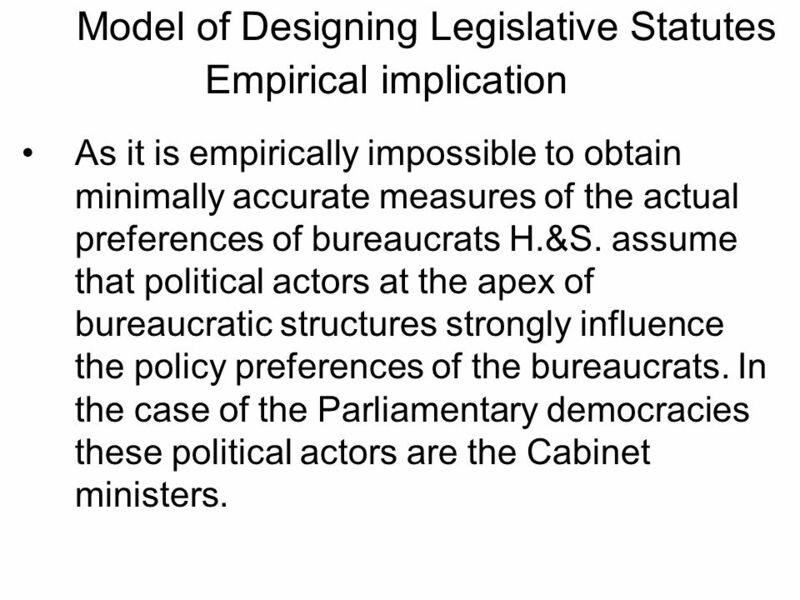 Hypotheses Hypotheses are working models that we adopt temporarily. Our starting hypothesis is called. Statistical Techniques I EXST7005 Lets go Power and Types of Errors. Plan for Today: 1. Wrap-up of points from Sagan & Waltz debate. 2. 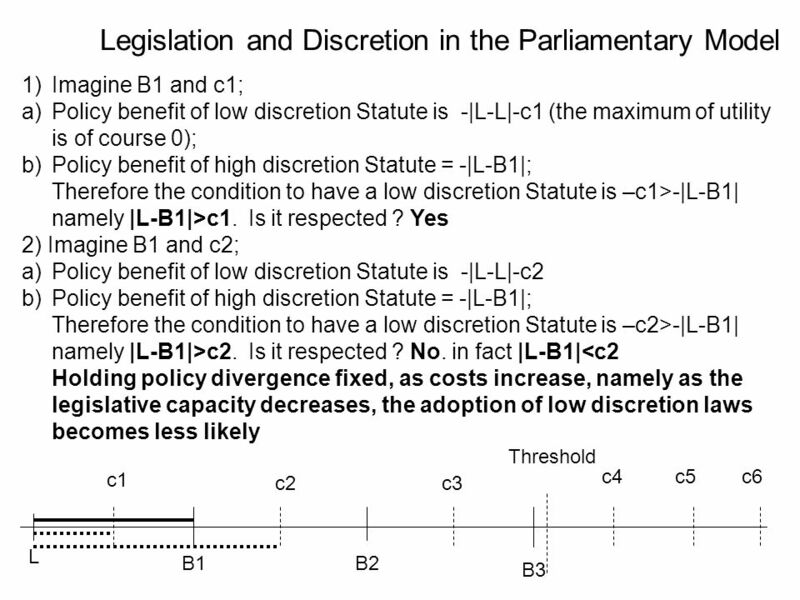 Evaluation of decisionmaking approaches. 3. Introduction to constructivism. A camper awakens to the growl of a hungry bear and sees his friend putting on a pair of running shoes, “You can’t outrun a bear,” scoffs the camper. His. Understanding Management First Canadian Edition Slides prepared by Janice Edwards College of the Rockies Copyright © 2009 Nelson Education Ltd.
1 Today Null and alternative hypotheses 1- and 2-tailed tests Regions of rejection Sampling distributions The Central Limit Theorem Standard errors z-tests.